The Angels of the Apocalypse sculpture on the Seventh Day Adventist European HQ in St Albans faces on to the main street of the town and its angular shapes are familiar to everyone. So familiar to me that, despite having lived there for years, I’d never bothered to find out anything about it. It’s by Alan Collins, ARCA (1928-2016), an English religious artist who lived much of his life in the USA and who taught at Seventh Day Adventist universities. His sculptures in Guildford Cathedral, better known but less visible than his St Albans angels, won the Sir Otto Beit medal in 1964, and he made the lettering on the Kennedy memorial at Runnymede, a remarkable commission because he did not specialise in letter cutting. modernist architecture in a conservation-conscious town more interested in its Roman, medieval and Victorian past than in the 20th century. I knew that Parma was the home of a great ham and a great cheese but I didn’t know that it was the home of the great printer and typographer Giambattista Bodoni (1740-1813) until I went to the exhibition of his books at the St Bride Library in the City of London, next to St Bride’s, the printers church. (Closes 12th October 2018.) 2018 is the bicentenary of his Manuale Tipografico, published posthumously by his widow. Bodoni was the creator of the beautiful typeface named after him, a typical late 18th century innovation with a vertical emphasis and a strong contrast between thick and thin strokes. It is particularly good for title pages but was also designed as a book face. Bodoni’s practice was unusual in that he was type founder, printer and publisher, when the custom at the time was for booksellers to commission books from printers, who bought their types from specialist founders. There is a biography of him in Wikipedia – its entries are variable but this account is good. He came from a family of printers and played with his father’s print paraphernalia as a boy. He started young in the trade, showed his brilliance quickly and his fame spread. He planned to come to England to work in Birmingham with John Baskerville, another great type designer, also an energetic businessman and political reformer, but was prevented by illness and went instead to work for the Duke of Parma in a small provincial town in northern Italy. He stayed there for the rest of his life, producing some of the most beautiful books ever printed. His elegant title pages, with few words, lots of white space and little ornament, have the “noble simplicity and calm grandeur” of neoclassicism. The curator at St Bride’s pointed out to me that, if you didn’t know anything about the history of type, you would think they were printed in the 1950s. I asked him if the books were all from the St Bride’s library. Some were, but most were his. He is a passionate collector of Bodoni editions and keeps his eye on Italian auction houses, going on buying trips several times a year. The Italians require export licences for anything over fifty years old, and after making his purchases he has to wind his way through the Italian bureaucracy to get these lovely editions out. He lives in a world of books. His wife is an antiquarian book restorer and has a workshop cluttered with bookbinding tools she has inherited from previous generations of bookbinders. Twentieth century type founders reproduced Bodoni’s classic typeface and added condensed and bold forms for titling. To my eye, Bauer’s version is the closest to the original. A doorplate I photographed at GSoA in 2006. When we were in Glasgow last week, the scaffolding on the art school obscured most of the Mackintosh building but indicated that it would soon be re-opened, improved beyond its condition when fire struck in 2014. Now comes the shocking news that another fire has damaged the building, undoing most of the painstaking restoration of the last three years. The cause of the fire in not known yet. The 2014 fire was caused by gases from a canister used in a student project. (The Harrow art school fire at the University of Westminster in 2007 was also said to be caused by the ignition of materials used in a student project.) Will there be funds for another restoration? I hope so: the Mackintosh building is Grade A listed and an important part of Scottish heritage. 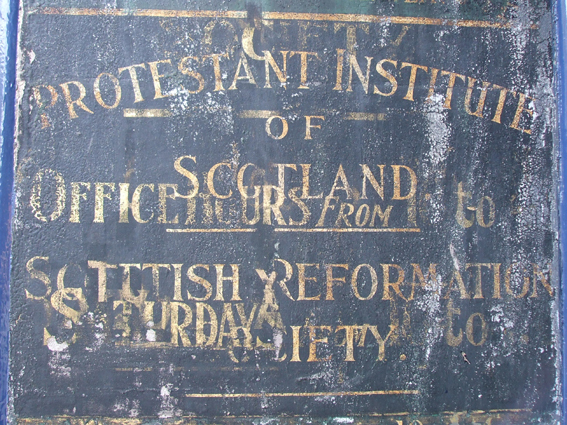 Glasgow was one of the first British government art schools to teach pottery. In 1893 the school opened its Technical Art Studios, teaching stained glass, needlework, bookbinding, painting on china, and metalwork. 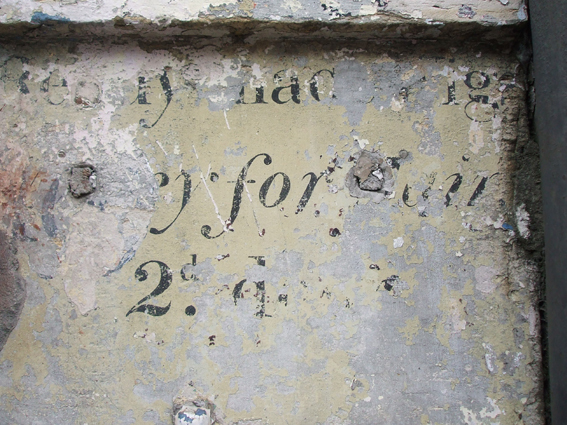 The chairman of governors was James Fleming, a pottery manufaturer. A prosperous society renews everything quickly, so there are few old things left in public places, and old things are given the heritage treatment, which makes them brand old instead of brand new. 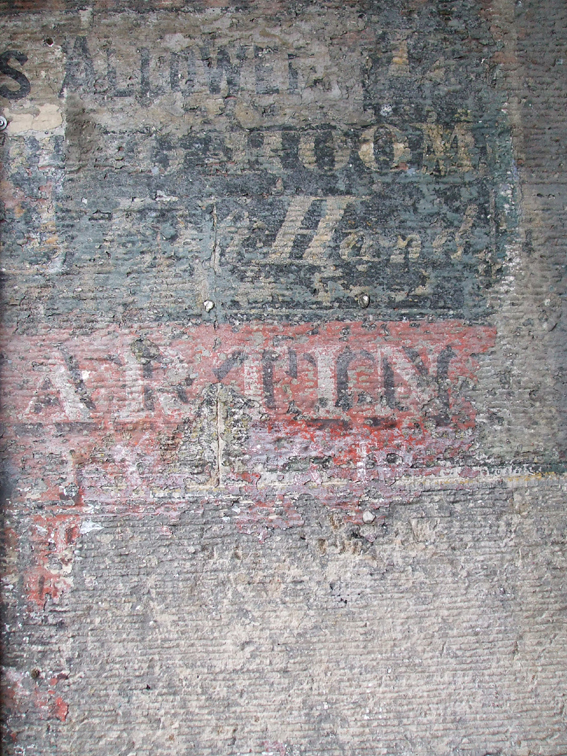 Occasionally, in neglected corners, old things remain, like these weathered signs I saw in Edinburgh. I was a graphic designer before I was a ceramic artist, which explains my interest in surface treatment. 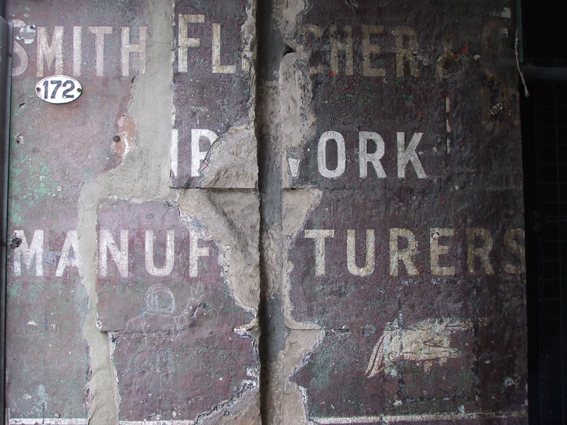 I like the form of letters, and these examples of the sign writer’s art were beautiful even before they decayed. After years of weathering and indifference, they have become like abstract paintings, the letters reduced to mere shapes and marks.